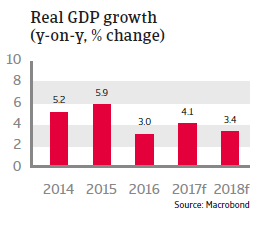 GDP growth is robust, but risks in the banking and corporate sectors have increased while high dependence on capital inflow remains a major vulnerability. In a referendum held in April 2017 major constitutional changes were approved, which means that the country will feature a presidential system, abolishing former constitutional checks and balances. While the presidential system will officially be implemented after the November 2019 general elections, (President Erdogan could serve two additional 5-year terms as president) de facto political power already lies with Erdogan. The narrow referendum result (just 51.4% in favour), highlights the serious political division within the country, especially when considering that the no-camp was restricted in its freedom to campaign. While the state of emergency declared after the failed July 2016 coup attempt has once again been extended, the massive crackdown to purge officials suspected of having links to the coup and the Gülen movement have continued. So far, around 150.000 people (including military, police, judges, prosecutors, journalists, civil servants, etc.) have been suspended, sacked or arrested. The rule of law and the human rights situation are further deteriorating. Businesses could get a trustee assigned in their management to oversee their business. The southeastern part of the country remains affected by the civil war in Syria and cross-border interventions by the Turkish army. Fighting between Turkish forces and the Kurdistan Workers´ Party (PKK) has flared-up again after Ankara ended a two-year ceasefire and terminated informal peace talks with the PKK. The risk of terrorist attacks remains elevated. Relations with the US remain strained, mainly due to Washington´s refusal to extradite Gülen and the US supplying arms to the Kurdish People’s Protection Units for their fight against IS. Relations with the EU and some major members (especially Germany) have deteriorated over criticism of the curbing of the rule of law and democracy in Turkey and the detention of journalists and human right activists with EU-citizenship. Given the increased political risks due to the turbulent domestic political situation, the new escalation of the conflict with the PKK, terrorist attacks and more strained relationships with the EU and the US, economic repercussions in the mid- and long-term cannot be ruled out, e.g. a sudden slowdown (or reversal) in capital inflows, a serious decrease in foreign investments and consumer spending. This could negatively influence economic growth, exchange rate stability, external funding opportunities, refinancing and insolvencies. Economic growth deteriorated after the failed coup attempt, but bounced back in Q4 of 2016, and is expected to increase about 4% in 2017. 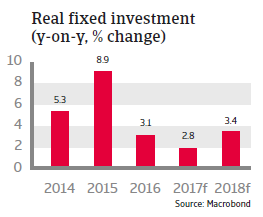 In order to stimulate faltering domestic demand, the Turkish government uses stimulus measures such as tax breaks and the expansion of its Credit Guarantee Fund in order to prop up economic confidence and credit-led domestic demand. 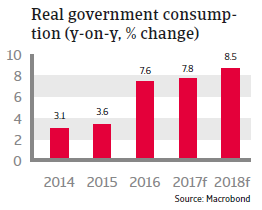 While the budget deficit is expected to increase above 2% of GDP in 2017 and 2018, government finances still have room for temporary stimulus, as government debt is still low at around 30% of GDP. That said, the business and investment climates are negatively affected by the deterioration in institutional quality. It is expected that the pace of economic expansion in the coming years will remain below the average growth rate between 2010 and 2015 - not enough to absorb the increase in the working age population of about one million people per year. The unemployment rate is already high at 11.5%, and inflation remains persistently high, affecting private consumption growth. The Turkish banking system is still sound, as banks are liquid and well capitalized (capital adequacy ratio of 16%), while non-performing loans remain generally low (about 3%). However, the government policy aimed at stimulating credit growth is worrying, as there has been a reversal of tighter regulations to slow down credit growth. The loan-to-value ratio has been relaxed from 75% to 80% and the government applies moral suasion on banks to keep mortgage rates low, despite rising funding costs. By now credit growth has exceeded the 15% ceiling previously considered by the Central Bank to be healthy. In the medium-run excessive loan growth could push up non-performing-loans. Through high corporate foreign currency debt banks are also indirectly vulnerable to currency risk. Total corporate debt has risen to about 66% of GDP by the end of 2016 (from 62% at the beginning of the year), encouraged by credit stimulus. About 45% is denominated in foreign currency. Turkish corporates (particularly in the energy, construction materials, steel, transport (airlines) and chemicals sectors) have extensively borrowed in foreign currency from local banks. As foreign exchange assets only cover about 40% of the liabilities, corporates run a substantial currency risk. Most at risk are smaller sized firms with earnings mostly in local currency that are not sufficiently hedged. Mitigating factors are that two thirds of foreign currency loans are in sectors with a natural hedge (e.g. 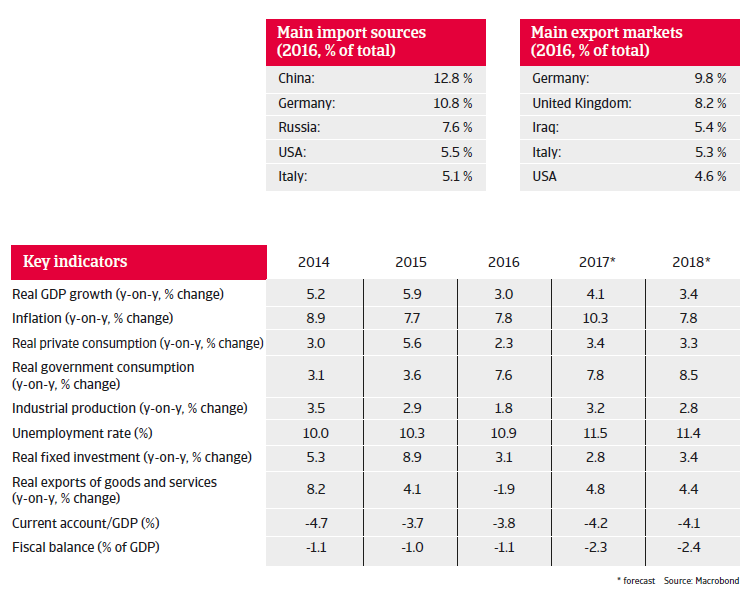 via export revenues). Moreover, foreign exchange lending growth has slowed, as government policy is promoting the use of credit in liras. So far, Turkish corporates still have good access to international capital markets. In the turbulent period after the coup attempt, Turkey faced capital outflows and a sharp depreciation of the lira, of about 17%, against the USD. Foreign reserves declined despite Central Bank measures to limit the drain. Although enough to pay for more than six months of imports, foreign reserves are insufficient to cover the external financing requirements. This year the exchange rate has stabilized again, partly due to overdue monetary tightening measures by the Central Bank, which somehow managed to resist government pressure to keep interest rates low. While it left its key policy rate unchanged, it has raised its late effective funding rate (Late Liquidity Window) from 10% at the beginning of 2017 in three steps, to 12.25% in April 2017. In order to counter rising interest rate expectations in the US and in light of inflation still well above target, the Central Bank may have to tighten its policy further. However, this would curb the domestically driven economic recovery, and may prove to be difficult facing pressure from the government. Turkey’s medium-sized, relatively closed, and low-savings economy remains vulnerable to shocks due to a high reliance on short-term and volatile portfolio capital inflows. 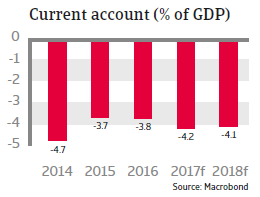 The current account deficit remains high in 2017 and 2018, above 4% of GDP. Positive export effects due to a weaker lira are countered by higher import costs on the back of rising oil prices and the ongoing problems in the tourism sector amid increased security risks. Increasing foreign debt and substantial capital inflows (foreign direct investment and portfolio capital) are needed to cover the current account deficits. However, since much of those deficits are financed from volatile short-term capital inflows and sensitive portfolio investment, this makes the economy very vulnerable to any negative shake-ups in financial markets, which could trigger a massive capital withdrawal and could also lead to more fluctuations in the lira exchange rate. Currently external debt (which is mostly held by the private sector) is considered sustainable, but the level is high (more than 200% in exports of goods and services), and sensitive to rising interest rates in the US and exchange rate risk. For the time being shock absorbing capacity is underpinned by sound government finances, a still solid banking system (despite increased risks) and still good access to international financial markets. Yields on Turkish government bonds continued to ease back to more normal levels since it reached an all-time high in January 2017. Good access to capital is key to ensuring that the large infrastructure projects, which are part of the “Agenda 2023”, are accomplished. 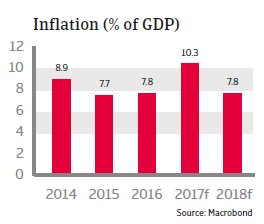 The future earnings capacity of the Turkish economy is constrained by macroeconomic imbalances related to high credit growth, high inflation and a large external deficit, coupled with structural issues related to its low savings rate and weaknesses in competitiveness, limiting FDI inflow. The investment climate is also hampered by a weak judicial system and an inflexible labour market. Moves to privatise state banks and the power sector are also proceeding too slowly. Without structural reforms to raise savings, reduce dependency on energy imports and improve the investment climate, Turkey´s potential growth rate will decrease to 3% - 3.5% per annum. However, no major structural reforms are expected in the current political situation. Compared to one year ago when 57.1% of B2B invoices were reported to be overdue in Turkey, the percentage has decreased slightly in 2017 to 55.9%. 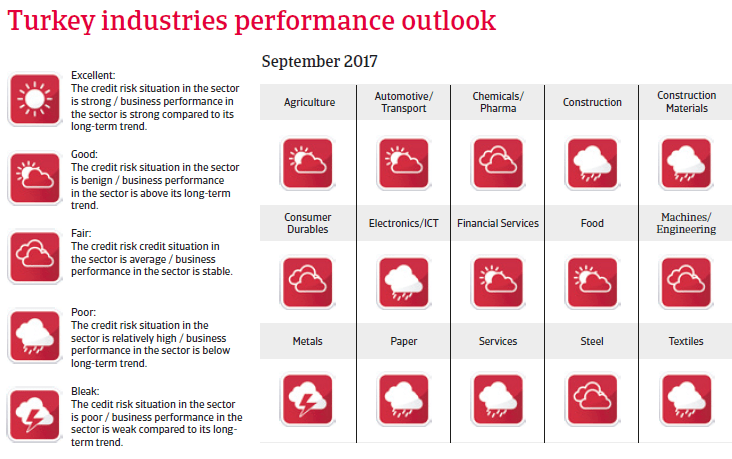 Payment behaviour of many Turkish businesses has deteriorated since 2015, and key sectors continue to face problems in 2017 due to increased uncertainty.